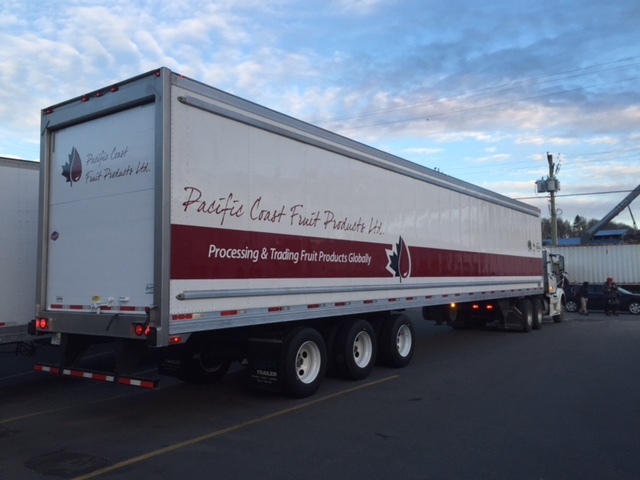 Pacific Coast Fruit Products Ltd. | Our Story - Pacific Coast Fruit Products Ltd. The Pacific Coast Fruit Products’ story began with 2 girls who lost their jobs, a glass of the grape and a dream! Ellen MacIntyre and Dianne Klatt had been managing a state of the art IQF and juice processing facility in 1988 when the plant was sold and they found themselves out of work. Deciding to combine forces they opened up shop in rented offices in Abbotsford, BC. Shortly thereafter they were approached by several local raspberry growers asking PCFP to look after their fruit. The close ties developed with local growers and packers have only strengthened as the company has grown. They began with local raspberries but now process many other fruit items from local and US growers in addition to purchasing stock from neighbouring processors as well as facilities in the US and abroad. The other aspects of the company have also grown substantially and Pacific Coast now trades in fruit products from accredited suppliers all over the world. “The Girls” are now “The Ladies” and there are 100 people working for Pacific Coast Fruit Products year round with another 100+ in the summer fresh harvest. They are still following their path of careful growth and continuous improvement..